BRINED-ROASTED PUMPKIN SEEDS, AND A BLOG AWARD! As I mentioned on my last post, we love to make our own pumpkin puree. The pulp stores well in the freezer and we can use it for pies, soups, sauces or anything else that calls for the canned product. Once that pumpkin is cut open, don’t even consider discarding the seeds. 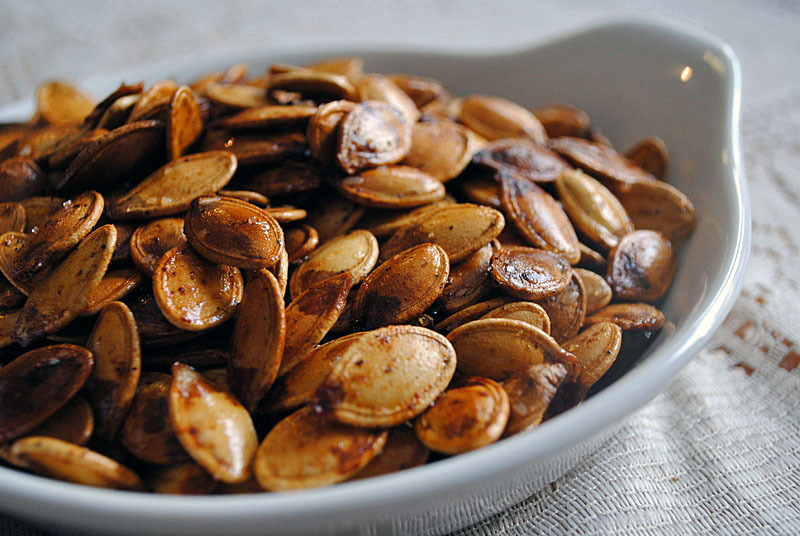 Roasted pumpkin seeds, home-made, are a special delicacy. Until now, we’ve followed traditional recipes that simply lay the seeds on a baking sheet, lightly coated with oil and a little seasoning. This time, I took a slightly different route: I brined the seeds before roasting, and what a difference that made! All credit goes to Sawsan, the wonderful blogger and ultra-talented photographer from Jordan. Check her post about it here. Scoop out the insides of your pumpkin. Separate the seeds from the stringy core and then rinse them. Bring to a boil. Let simmer for 10 minutes. Remove from heat and drain. Spread your seeds on a baking sheet and allow to dry completely. Drizzle the seeds once they get dry with olive oil, sprinkle with the powdered ginger and paprika, or any seasonings you like, and mix to coat them as evenly as possible. Spread the seeds out over the roasting pan, all in one layer. Bake in a preheated oven at 390-400 F (200 Celsius) until they become golden brown or are roasted the way you like (10-20 minutes). Allow to cool, and…. Comments: Three great advantages in this brining approach: first, the salt gets into the seed instead of outside only, so you won’t get excess salt in one bite and not enough in another, which is quite common in the “old” method. Second, the roasting time is reduced quite a bit, as the seeds will have a chance to start mellowing down in the brining step. Third, a more pleasant texture in the final roasted seeds. Try it with different seasonings, Southwest spices, chili, I bet even a little curry could be pretty interesting. Sawsan, thanks for teaching me about brining seeds, loved it! What is your favorite color? Maybe yellow, but I do love all colors. Your favorite animal? I am a dog person as far as pets go, but my favorite animal is the elephant. Your favorite non-alcoholic drinks? Home-made carbonated water (Penguin). Twist of lemon is optional. Facebook or Twitter? I use Facebook because my blog posts are publicized there and I get messages from readers. I don’t like Twitter, and that is a good thing because I wouldn’t have time for it anyway. Your favourite pattern? I love horizontal stripes, just the other day I noticed that a lot of my clothes have stripes. Your favorite day of the week? Friday. Your favorite flower? 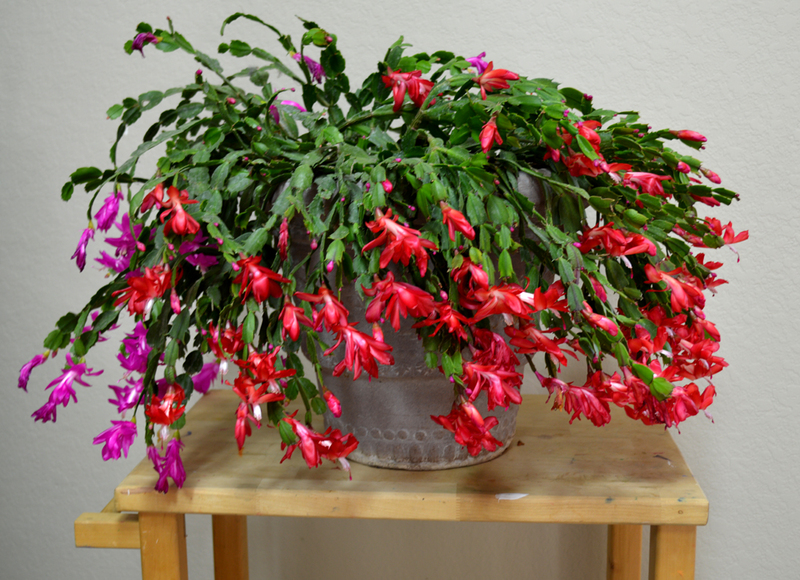 Christmas-cactus in full bloom. What is your passion? My work. But fitness comes a close second. Cookbooks get the bronze medal. Alison, thank you once again for the award! Makes blogging even more fun! Congratulations on your award Sally, very well deserved. Congratulations are in order, Sally, for a much deserved award as well as for your unusual recipe for brined-roasted pumpkin seeds. Never in a million years would I have thought to brine pumpkin seeds. You deserve an award for being you, but as far as I know those aren’t given out. Perhaps I’ll start my own award and you’ll be the winner. Congratulations again. 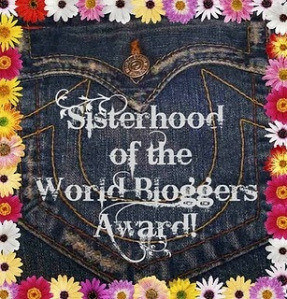 The Sisterhood of the World Bloggers is an organization of impeccable taste! Brilliant! I will definitely try brining my seeds. Something tells me this will be a winner of a technique. And congratulations on your award! Who could tell, right? I was also surprised when I first saw that at Sawsan’s blog. Congrats, Sally, on this much-deserved award! I’m sure there’ll be many more coming your way. I rarely toss the pumpkin or squash seeds but don’t rost them, either. Lucy, my parrot, gets them. She gets a half-dozen or so seeds every night at bedtime. They make her happy. Trust me, you do not want a cranky parrot. 🙂 Still, I’ve pinned the recipe just in case I have a surplus one day. Your comment made me smile… my former Mother-in-law had a parrot, he lived 33 years with them. He was AMAZING. Not only he could sing a bunch of songs (when he was in the mood), but when we were having dinner, he would stare from his cage. She would place a little plate at the bottom of his cage with samples of everything we were having. Now, believe it or not, if she did not include one particular dish, say, the green beans, he would trow a fit. Literally. Would not stop screaming, banging his feet on the cage, until she gave him a tiny bit of green beans. She would do it sometimes just to show his reaction for the guests who did not believe her “parrot tales”. HIs name was Zepple. We love Sawsan too. And we hate discarding the seeds. What a great recipe. Congrats on the award. That’s so interesting. I can’t wait to try it! I would never have thought of bringing seeds before roasting, but I bet the flavor is fantastic. Always good to learn something new, isn’t it? I am also very fond of greek yogurt for breakfast, sometimes by itsef with just a drizzle of agave nectar, but now that you mentioned pumpkin seeds, I wish I still had some of these! Try the brining, I am sure you will be hooked – hey, how about that for a food blog title? HOOKED ON BRINE. Oh, well, I’m extra silly today. I’ve never heard of brining seeds before but what a great idea! I bet it gives them a great salty flavor…and what could be better than that? Thank you so much! Glad you stopped by….